2012 has become my year of “yes”…well, at least as far as pushing my boundaries and what I thought I could do. Maybe I’m not doing “one thing a day that scares [me]”, but definitely more things this year than any year before, or even all those years combined! My good friend and I recently had a discussion about the next five years of our lives and one of the things that came out of that discussion was that we had two years to really dig deep and check off a whole shwack of items from our bucket lists. I actually didn’t really have a bucket list, so 2012 has become the year of not only developing a bucket list (of things I didn’t know I wanted to do), but also crossing them off! Run a 10k? Sure! Done! Join a relay team to run a 50 mile trail race through Whistler and Blackcomb? Why not!? Train for my first triathlon? Ok! Jump out of an airplane? Ok…that one’s taking a little more effort to persuade me to do, but I know it will happen. And today, Fun. 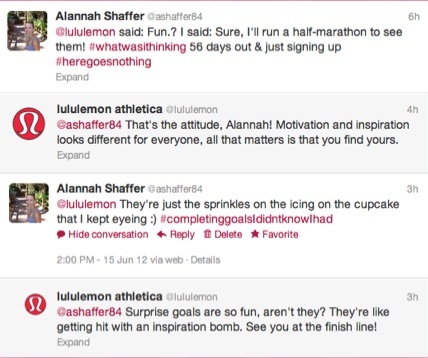 is playing the after party for lululemon’s SeaWheeze…Well, ok, I guess I could run a half marathon (in 56 days); why not!? My point is, surprise goals CAN be fun! And they ARE like getting hit with an inspiration bomb! And you really don’t know what you can do until you kick that little voice that keeps telling you “that’s not who you are” and “you can’t do that” OUT OF YOUR THOUGHT PROCESSES!